Left: Vladimir Mayakovsky, 1924, by Alexander Rodchenko. Right: The Collected Poems of Vladimir Mayakovsky, translated by Dorian Rottenberg, USSR, 1972.
and smeared the drab world with emotion. the jutting cheekbones of the ocean. I read the calls of lips yet mute. with just a drainpipe for a flute? 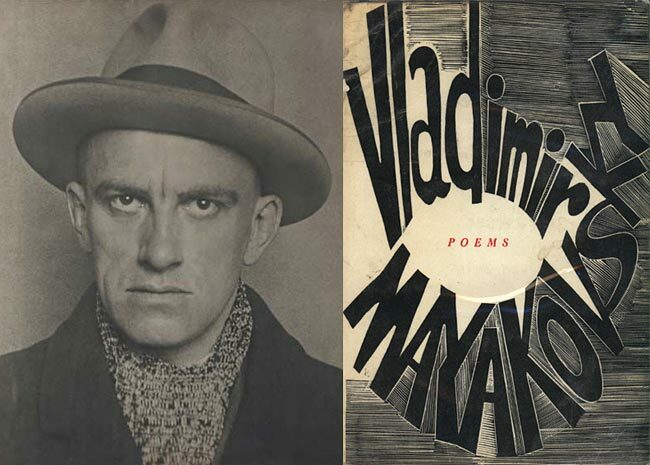 Source: Ubuweb has a free download of The Collected Poems of Vladimir Mayakovsky, my source for the book cover image and the poem.